THINK BEFORE YOU ACT ESPECIALLY WITH YOUR FINANCES. Giving up something doesn’t have to mean giving it up for good. 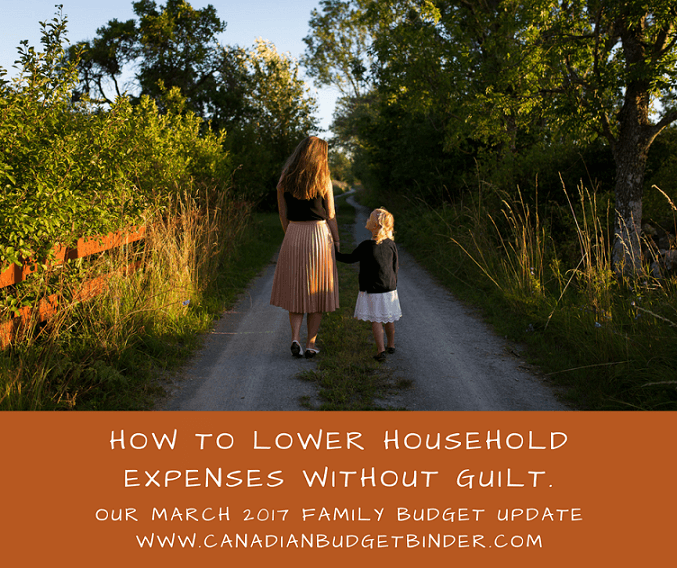 One comment I often hear when I offer budget help is that it’s so hard to reduce household expenses without feeling guilty. This guilt often leads to even more debt being created because of letting people down, including themselves. The provider(s) may feel they are not good enough to support their family which creates inner turmoil and struggles. No one wants to say you have to give something up, especially to a child. Anyone who has direct access to money or that is affected by the money will feel loss when something has to be chopped. A reader asked me how to deal with guilt while I was assisting them behind the scenes with their monthly budget. I know she will read this but now she’s in a better place and has her budget under control and her family is on board. How do you deal with financial guilt? You don’t- You jump over it and move on. You need to keep things under control and by doing so you’ll gain support by the very people the money shelters. You’ll be proud of the strength it takes to move from darkness into light with an outlook. Stay focused and you’ll see results. Stay in the hole and you’ll live in it. Perhaps if we look at lowering household expenses in a more positive light as opposed to a jail sentence then budgets will become easier to handle. Too many people stress themselves out when it comes to using a simple budget because of one thing, balance. The problem is that if you can’t balance something then you either have to take something away or add something to even things out. Most people don’t want to do either because that means having to find more money or taking away something that they may depend on. Thankfully, there are options available for those people who do set aside current trends to follow through on fixing financial health or to work with a limited income. A modern example would be the internet. We used to get by without knowing every move that someone took but today we’re obsessed with it. Having access to the world becomes somewhat of an addiction that is hard to break for many people. The thought of going to the library to access free WI-fi or other hot-spots is inconceivable to someone who has home internet or a data plan on their cell phone. As the case may be the extortionate price of cell phones coupled with high monthly expenses is just as alarmingly met with excuses as access to the internet is. Some people would rather go into debt to hold on to these wonders of the technology world then to let them go temporarily to free themselves from financial harm. These are just two examples however financial guilt may grow deeper when you involve kids or other dependents. You can’t spend what you don’t have. When you’ve put your kids in 3 different sports but can hardly pay the bills it’s time for a financial check-up of your household expenses. You may need to pull the plug on piano lessons or you no longer can afford extravagant birthday parties or fun nights shopping at the mall. The emotions all comes back to the budget leader because they are in charge of the money. If you’re following a monthly budget for the first time you may start to notice areas that need attention. You then must either reduce household expenses, work more hours or pull money from savings just to get by. If none of these are followed through on then you’ll create debt. No one REALLY wants to do any of those, myself included. Having debt you struggle to pay back is no fun at all especially at the expense of your health and relationships. Related: How to make extra money without going crazy. The favourable part is that you only have to deal with yourself if you’re not in a relationship with joined bank accounts. Even then when you keep your finances separate it can put a strain on one person if the other can’t afford to do the same things as they can. This can weigh heavy on the partner who is paying extra or not getting out and having the fun they want. Perhaps you are in a relationship or you’re married (with or without children). There is more at stake then just your emotions when it comes to chopping household expenses. If you’re in charge of the household expenses and you give then take away perhaps explaining the reasons why will be helpful. I’m sure if Mrs. CBB came to me and said my $50 allowance was being axed I’d want to know why (and cry a little). I’m used to having that monthly spending money and without a clear explanation I’d become bitter. When money is tight emotions can run high which only escalates the problem. Set aside emotions to focus on the task and you’ll not only learn more information about your spending habits but you’ll have a clear picture of what you need to do. For example, if you are unable to pay for your children to join 3 sports this year opt to supplement that loss with a family excursion to do or see something new. Road trips, nature trails, waterfalls and so on are often met with excitement because of new surroundings. If you spend too much money on health and beauty at Shoppers Drug Mart find alternate solutions to lower the expenses, a new beauty provider or go without if possible. Related: How to collect Optimum Points Fast. If you can’t stay away from hardware stores or from buying ‘toys’ opt for looking at second-hand purchases before buying new. This will help to lower household expenses but allow you to splurge a bit without feeling deprived. You don’t have to just take something away abruptly that causes financial strain rather find an alternate solution that includes something inexpensive to fill that void. Don’t wait months or years either. Take a day or two to brainstorm ideas before you slash household expenses and then do it. There are times Mrs. CBB and I find ourselves talking about why we aren’t advancing our budget since we are now debt free. Should we really be so frugal when there is no need, or is there? My advice and I don’t give it often but don’t ever lose sight of your future path just because you feel ‘comfortable financially’. It would be great if knew we would always be debt free BUT that’s not the case, we don’t know. On the other hand we are fortunate that we can safely spend a bit more but with-in reason. For example, Mrs. CBB purchased a brand new Galaxy Samsung 7 for $500 which would have been a no-no when we had debt. The last new cell phone she purchased was in 1999 from Rogers with a monthly plan. She never upgraded until she bought a used Iphone 4 for $75 off Kijiji. This is part of that temporarily putting ‘wants’ on hold until the path is clear to splurge a bit. We were still frugal with the purchase as it can cost upwards of $1000 with tax to buy the Samsung 7 new (less now as Samsung 8 will be released). Don’t beat yourself up if you have slim down your household expenses because what you do today will affect your tomorrow. Always think about alternatives and the way you communicate any financial changes to your family. Remember unless you teach your kids about the value of money and how it can impact lives they might not understand. There are adults out there that won’t understand and probably never will but if we all just think before we act I’m sure we’d be met with support rather than opposition. This also helps release any stress or guilt felt by those who are in charge of the monthly budget even if that means having a conversation with yourself. Discussion Question: How do you lower household expenses without feeling guilty? Do you involve everyone who will be directly affected? Can you believe we are already in April? During the month of March Mrs. CBB and I really didn’t get out of the house much at all. Most of our receipts were for gasoline and groceries. Now that the Spring and summer months are upon us we will see more money going towards home maintenance hopefully to get some of these renovations completed. That’s our month of earning money and spending money. Test the budget for a few months and see how it goes. Trial and error, remember that. We didn’t always earn the income we do today but made do with what we were earning so we didn’t go into debt. That my friends is “living below your means”. The only science to becoming rich! Our savings of 62.04% includes savings and investments and emergency savings for this month. 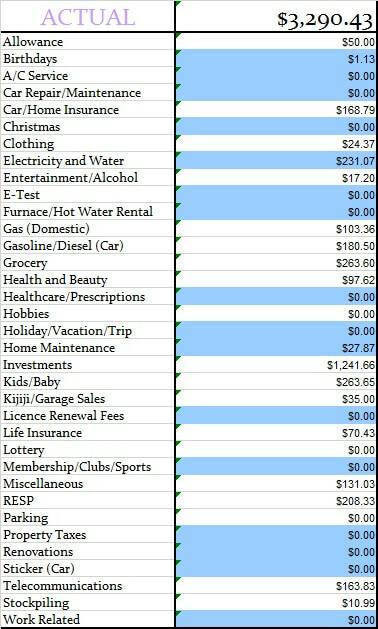 If you include the projected expenses savings, we actually saved 80.64% of our income. That’s $8531.81 going into savings or investments of some description or another. The monthly totals comes to 100% which shows that we accounted for all of our income. The other categories were well within the defined percentage limits. Our projected expenses this month is at 18.60%. Just 10 years ago I started working in Canada making a bit over minimum wage and have since moved up the ladder. I’m now working very hard to secure my dream job with one foot in the door. We aren’t all lucky but if you do the best you can at least you can look back and say you gave it a shot. For now we will have to manually track which means month after month we add up what we save in each projected expense category and minus what we spend so we know how much we have and what is left in each category. I have updated our personal excel budget spreadsheet for 2017. So the $1967.68 gets paid into the projected expense account every month no matter what. It seems to be easier to track our money this way but you can do what works best for you. It’s a fairly easy process essentially becoming a lifestyle change for your finances but the most important part is that the money is available and saved, which means potentially less stress. This means we should have $600.00 per year for clothing to spend. We have to track that expense as we spend it manually but hopefully when I find some time I can incorporate that into our budget spreadsheet so it tallies the numbers up as we go along. That way we will be able to know exactly what we’ve spent as an ongoing total. Time for the juicy category numbers and to see how we made out with our monthly budget. Below you will see two tables, one is our monthly budget and the other is our actual budget for the month of February 2017. This budget represents 2 adults and a toddler plus our investments. 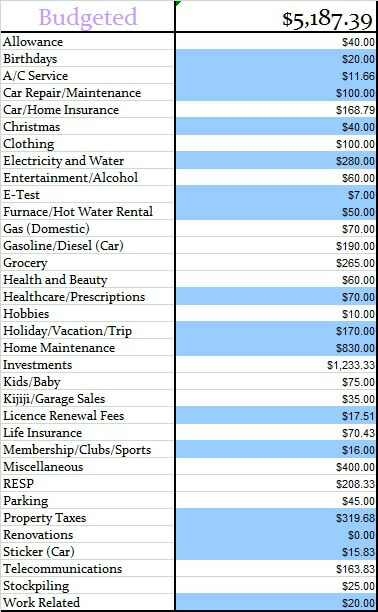 If highlighted in blue that means it is a projected expense. You will also see our budget does not include the emergency savings as it is factored in at the end. 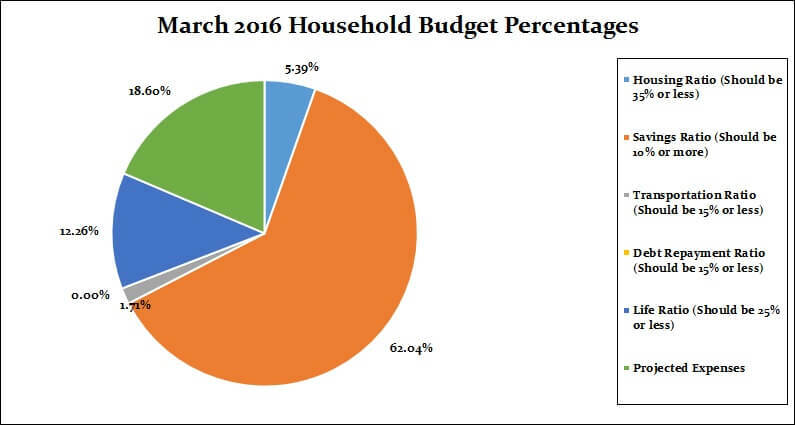 There will be a few changes to the March budget such as my allowance bumped to $50/month Groceries $265/month, Car Insurance/House Insurance $168.79/month, Investments $1241.66/month, Rogers Telecommunications we’re waiting on a new billing amount. Here are our April 2017 goals along with whether we completed tasks from March 2017. For the months of April and May we will keep our goals small because of our future plans in June and July coming up quickly. Once we are home for the summer we can tackle a bit more possibly hiring people to come in and get some of the renos started. Call around to lawyers to talk about getting a Will written up- Will is in process. Start revamping old blog posts: I completed 1 in March. Finish the master bathroom shower- I will explain more about this later as we’ve had some changes. Buy a new blind for the garage- Now that garage season is here I’ll be on the look-out for something to fit the window. Finish revamping our sons room- We are almost there but still have plenty to do. Most of what we’ve focused on is selling stuff and organization. Start researching vacation spots for 2017- Booked but still looking for a 3 day mini-trip. Start preparing for our holiday- We’ve mostly just talked about this for now. Find some nice friendly personal finance bloggers to guest post while I’m gone- So far we’ve got 3 personal finance bloggers who will be supporting CBB on vacation. In case you missed our budget updates and want to do a quick search I’ve compiled them all on one handy page: monthly budgets. 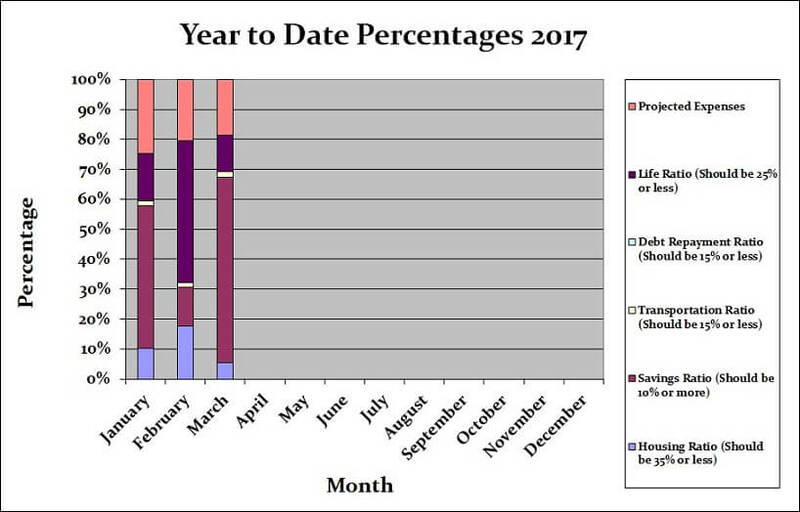 For the 2017 Year I will also keep track of each month below and update the monthly budgets page. That’s all for this month check back at the beginning of May 2017 to see how we made out with our April 2017 budget. Don’t Forget To Subscribe To The Blog and Activate Your Subscription!! Wow! 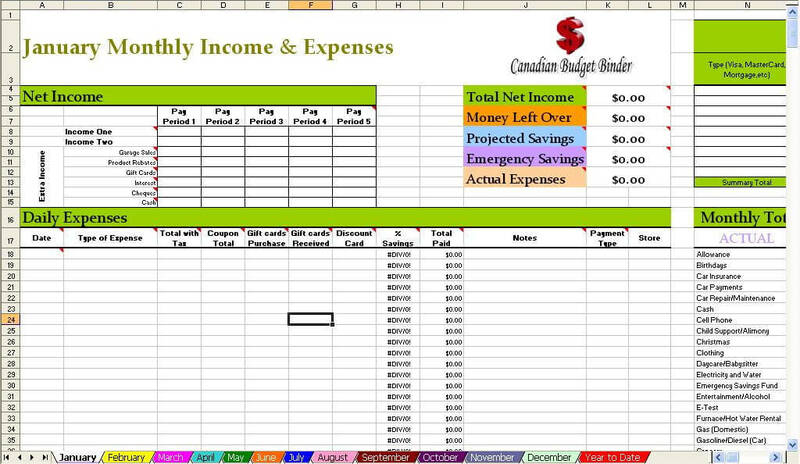 I hope one day I can put together a budgeting sheet like this. This is awesome. I’ll have to keep checking in to see your progress. Good luck on your financial journey.